AMS Pivot Springs for Wood Mouldings are installed on hardboard backings and fixed onto frame by pushing the prolonged tip into wooden moulding. These springs have an elongated hole with a diameter of 0.26” (6.6mm) for eyelet/rivet engagement. 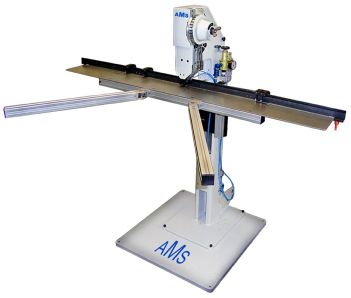 The new AMS Hi-Pro Eyelet Installation Machine helps reduce frame production costs with pre-installation of eyelets. Boards with pre-installed eyelets can be easily stacked, and clips can be affixed to stored boards as required. Operator can easily select the distance of eyelets from the board edge. This machine is pneumatic (air-driven) to offer automatic activation with board contact and automatic feeding of eyelets -- this enables easy movement from installed eyelet to next eyelet installation position. Use with AMS Mini and Standard V-Clips as well as AMS Pivot Springs. Please contact AMS Customer Service for price quote.